Holy Toast miraculously appears on the Jay Leno Show. Hallelujah. 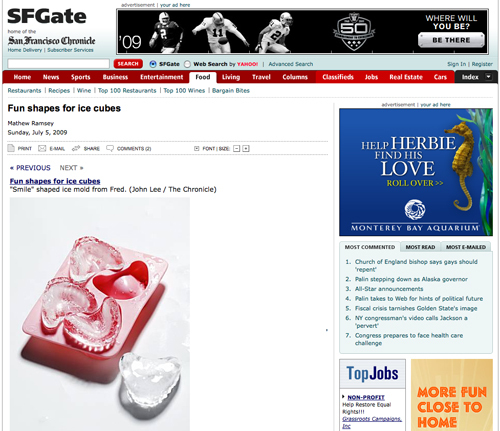 Frozen Smiles get a “perverse” mention on the NBC’s New York blog. I’ll take that. 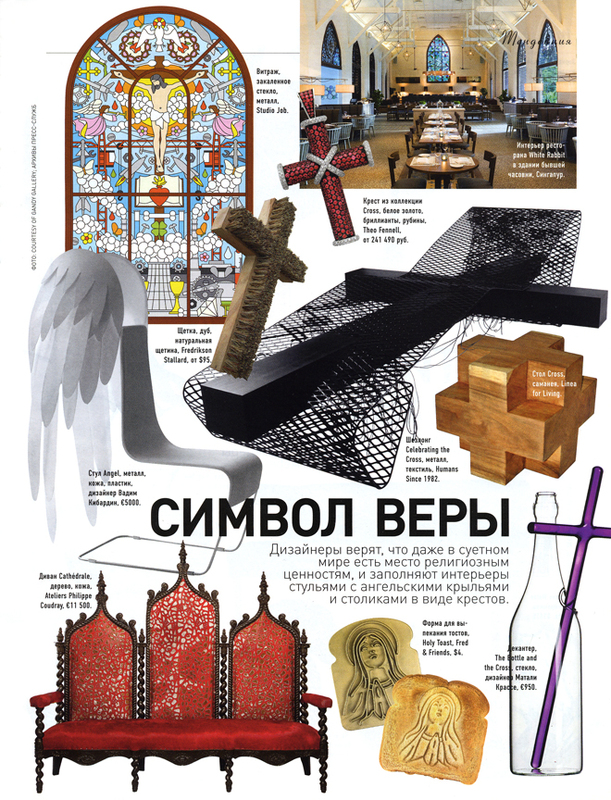 Received an issue of AD from Russia featuring Holy Toast in a spread of religious-themed products. I think they missed the joke a bit, but since I can’t read what it says, we’ll never know for sure. Happy to see it in there anyway. HERE‘s the spread. The San Francisco Chronicle gave Frozen Smiles a mention in their July 5th article. Have a looksee HERE. 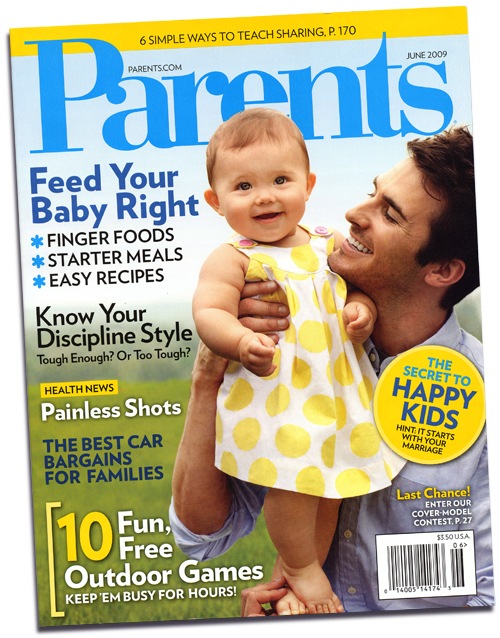 The June ’09 issue of Parents Magazine features Food Face. See it HERE. 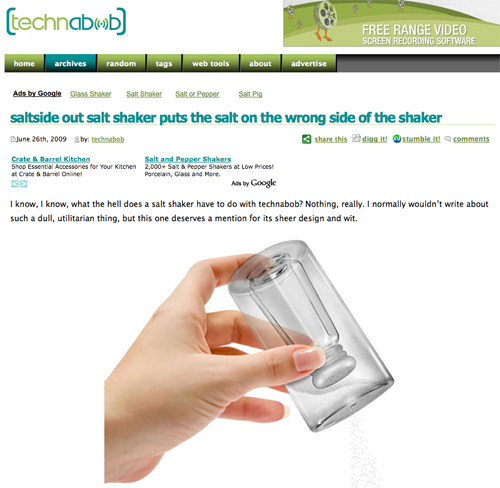 Technabob, the gadget and technology website posted on Saltside Out. 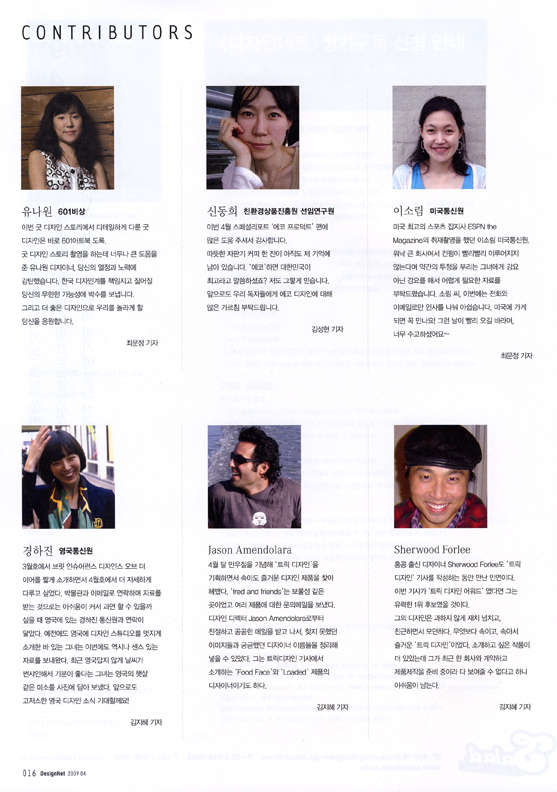 The Korean Design Magazine DesignNet asked me to contribute for their April ’09 issue. They featured Food Face and my Loaded wallet. I haven’t the slightest idea what the article says, but it looks great. The French Newspaper 20 Minutes recently interviewed me about Gin & Titonic. Click HERE to read the article (in French). MISSBEHAVE wants to know if Gin & Titonic is stupid or hysterical. I still can’t decide. Gin & Titonic received a mention on the Dec 20th edition of Car Talk, an NPR radio show by the infamous Tom and Ray Magliozzi. You can listen to it online HERE. Issue #11 of the Brazilian web magazine, Idea Fixa features a bunch of Fred product, as well as some seriously trippy art. See the issue HERE. 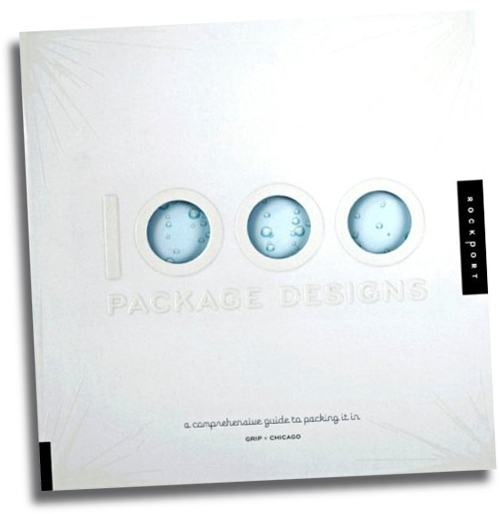 Some of my package designs were featured in a brand new book, 1000 Package Designs, put out by Rockport, and Grip Design. We scored four pages of this gorgeous survey of contemporary packaging. If graphics and packaging gets you excited, you might need some professional help. Join the club and buy it HERE. 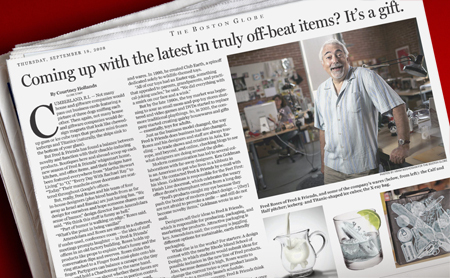 We were recently visited by The Boston Globe’s senior producer looking for an interview. We were poked and prodded to find out just what it is that makes us tick here. Fred, Joe and I sat in our small “conference-type” room and did our best to return the volley of questions she threw at us. It got a little out of hand at times, as we dealt with our obvious discomfort by acting silly or stupid. Being the complete professional she is, Courtney managed to see through the madness and craft a pretty nice article. See it HERE. The Today Show featured Snap-A-Party in the Aug 1st segment on fun outdoor entertaining. They also liked the Pick Your Nose Cups, and managed to show off the one with my schnoz on it. I’ve been told that your nose looks much bigger on TV than it does in real life. See the video, and my nose HERE. 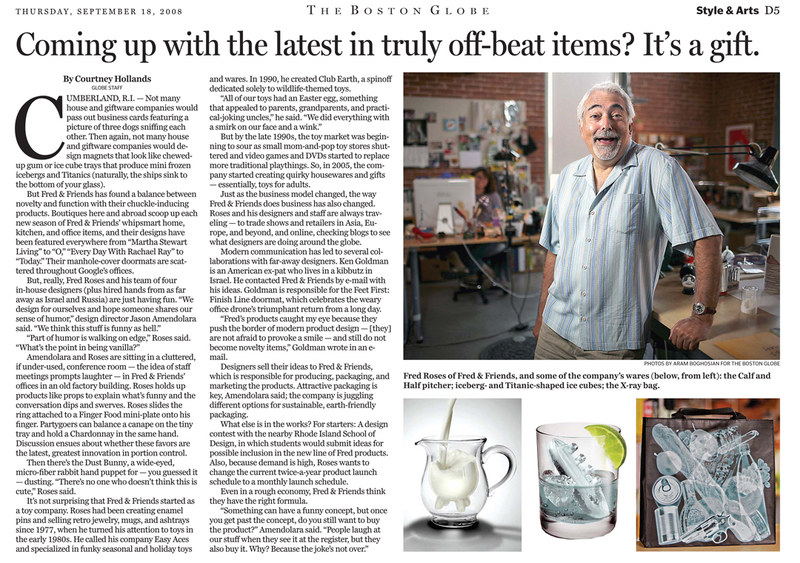 The June 12th issue of The Boston Globe has a big article on the resurgent tape theme in product design. My Cassette Tote made it in. Download the article HERE. 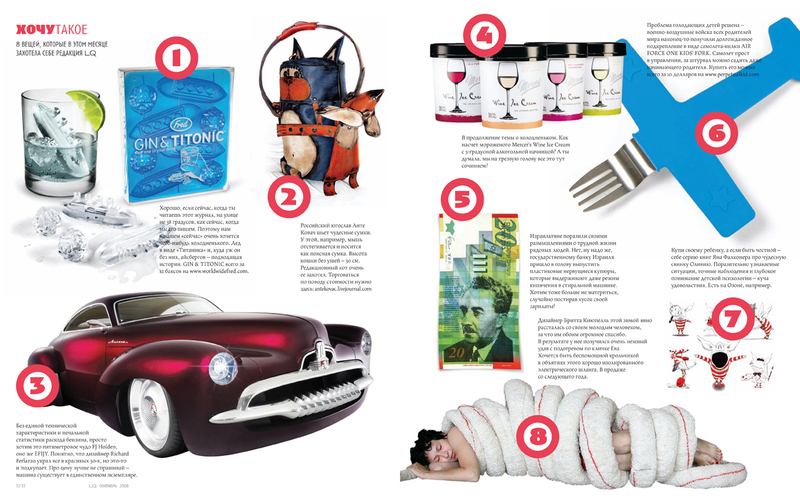 LQ Magazine featured Gin & Titonic in their Sept. issue. See the spread HERE. 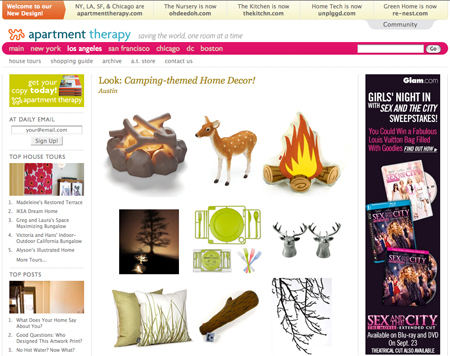 Apartment Therapy brings camping indoors, and includes Snap-A-Party. 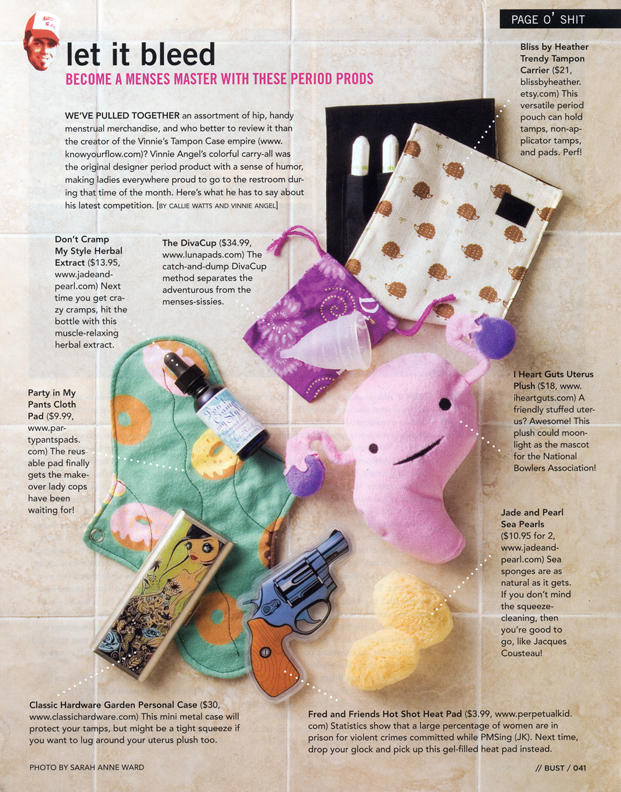 Bust Magazine has a collection of “personal” items for every woman’s favorite time of the month. Somehow Packin’ Heat made the list. I guess women have a proclivity to firearms when the hormones flare. See the article HERE. 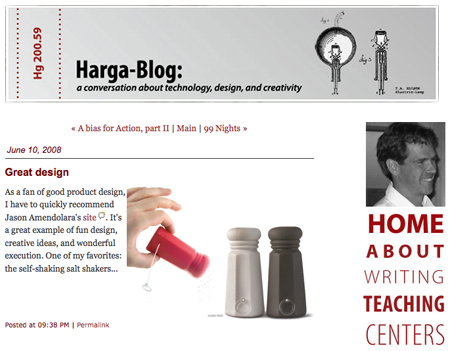 Andrew Hargadon is an associate professor, author and former product designer at Apple. He has a long list of other achievements that more than qualify him to comment about my work. I was very happy to get nod from the professor on his blog. See the post HERE. 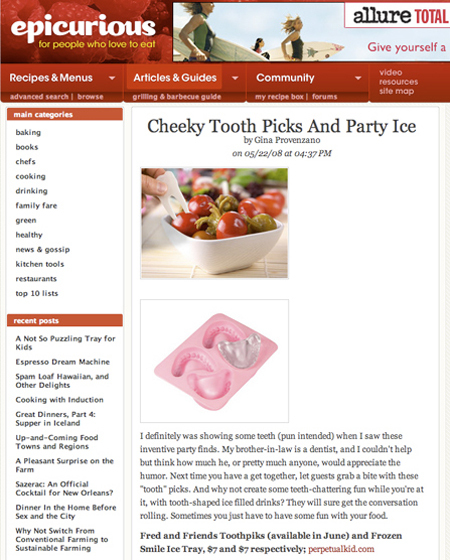 The foodie blog Epicurious featured Tooth Piks and Frozen Smiles. Link to the post HERE. We are so happy to be getting some really great press here in the States. When in comes in from around the world, we are like giddy little schoolgirls. 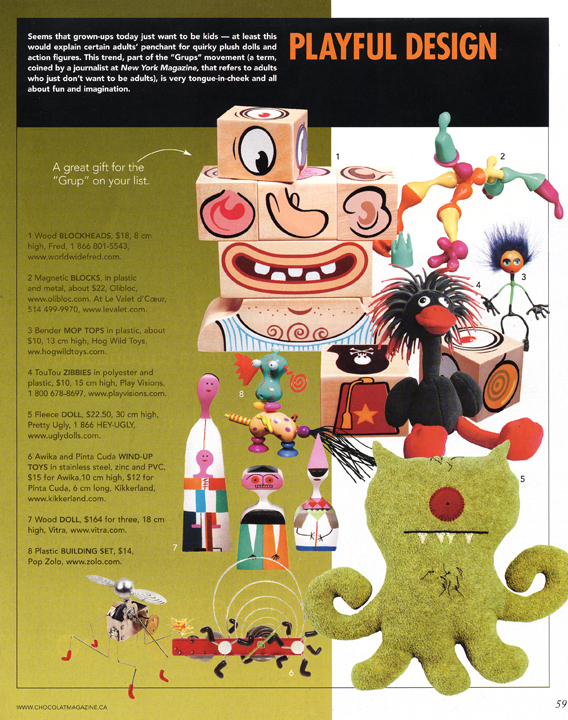 Here is a great big spread of Fred in the Bulgarian magazine Intro , which includes the Frozen Smiles. 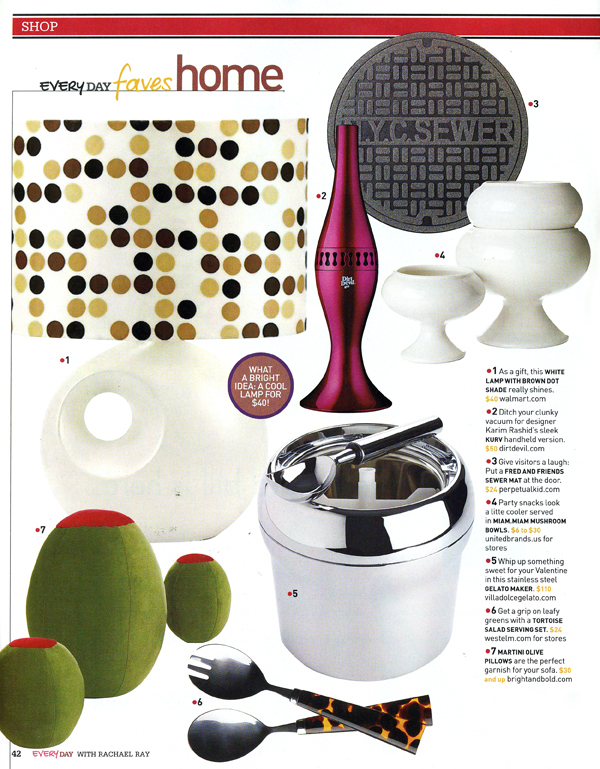 The Israeli lifestyle and design magazine, Shamenet “Cream” in Hebrew also featured Frozen Smiles in their latest issue. A friend tipped me to this photo of Google’s Offices in Zurich, Switzerland. They have really great taste in floor accessories, but their interior designer should be shot. See the link from Core77’s site HERE. As designers of product and packaging, we all love to get recognition from our peers. They get you, and what you do (or are trying to do). I was really pleased to see a posting on the dieline back in Dec that had some nice things to say about the packaging that we do at Fred. I’m a firm believer that over-packaging is a way of hiding a crappy product. If the item is good, it should be able to speak for itself, without all the flash and fluff. I have purchased many products with slick packaging, only to be extremely disappointed when I finally got to the real thing. I felt like I was tricked. We hopefully will continue to make products worthy of showing off. And dieline, thanks for noticing. 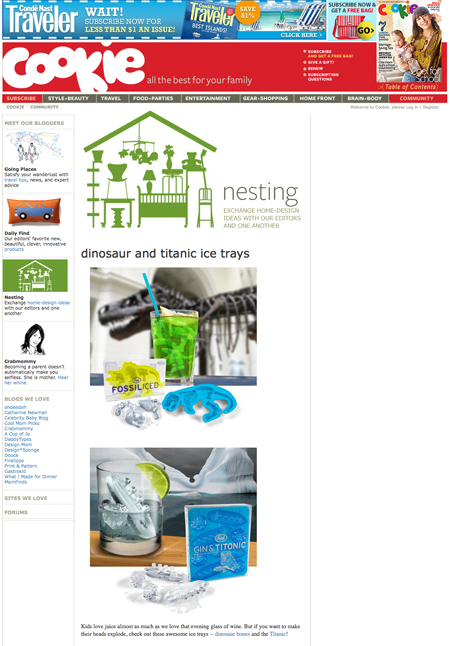 Nadejda at Pan Dan was nice enough to put Frozen Smiles on her really amazing design blog. Be sure to check her site out. See the posting HERE. Jean at NOTCOT also showed some love. Check out the post HERE, as well as their amazing TasteSpotter site. The Green Head has Hocus Poke Us, along with some fun videos of magicians and their unfortunate assistants. Thank you TrendsNow for the nice link. I have no idea what it says, but anything looks good in French. Bust Magazine is as hot as buttered toast. 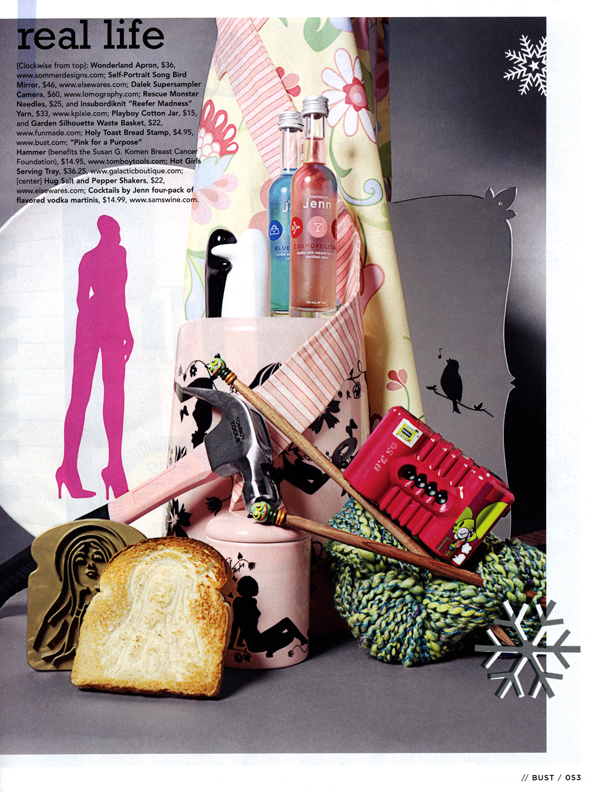 They happened to mention my Holy Toast in their Jan ’07 issue. 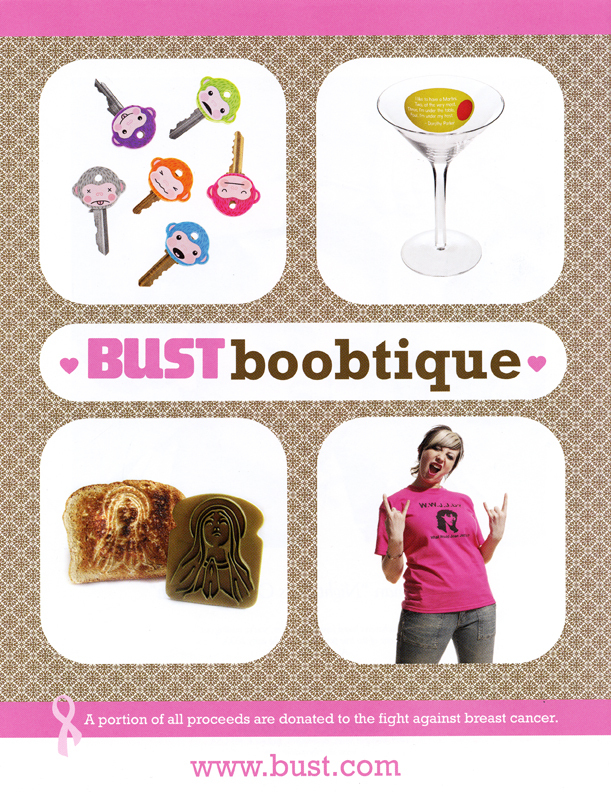 It also showed up on the inside cover for Bust’s “boobtique” store advert in the Oct/Nov issue. For some sick reason, this is one piece of press I am really proud of. 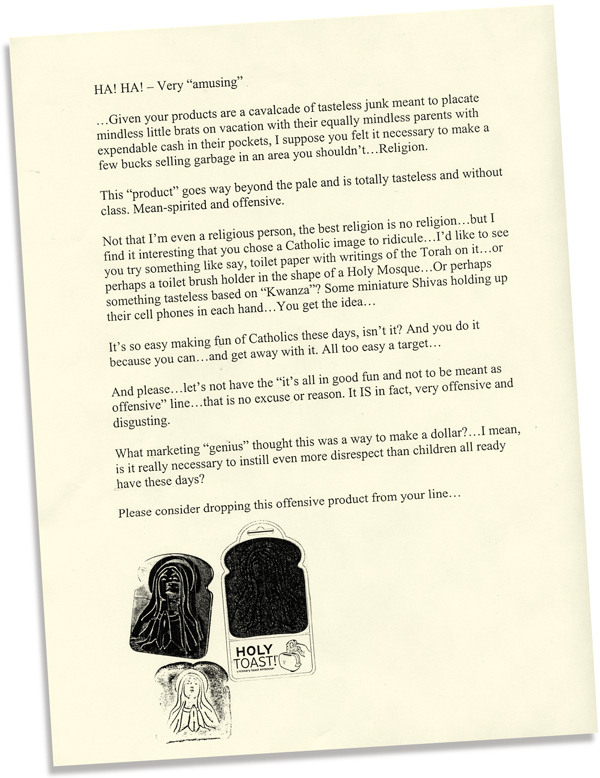 It’s a piece of hate mail one of our customers received after the Holy Toast first started selling. I think they missed the joke. I have a feeling they miss a lot of jokes. Read it HERE. I then found out that Holy Toast made news on a site called reverendmother, run by a Presbyterian Minister. She received one as a gift from a parishioner and loved it. I guess the hate press and holy press cancel eachother out. NY Times Feb 2007 style section featured the Feet First manhole cover mats. 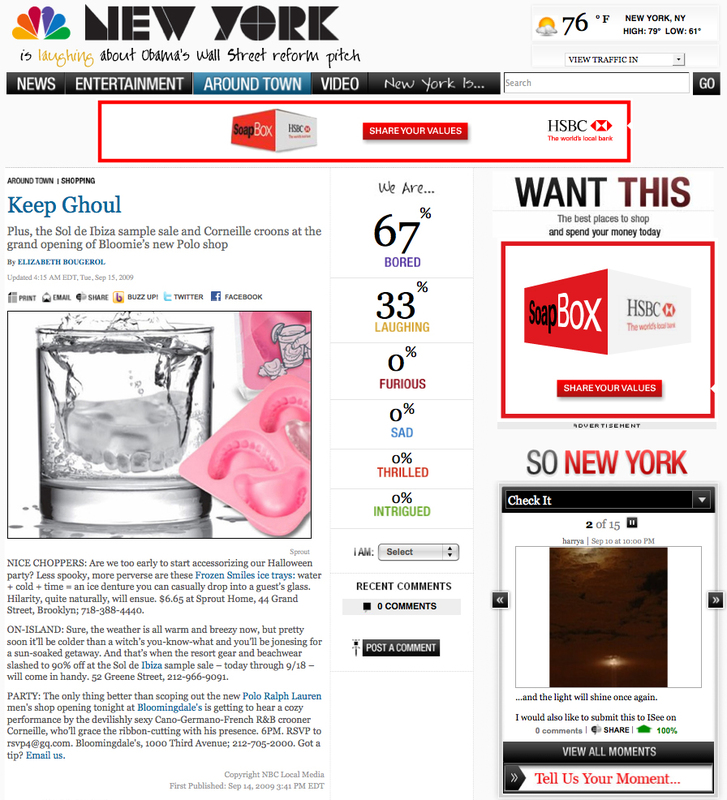 New York Magazine had some things to say about Snap-A-Party on their web shopping page. 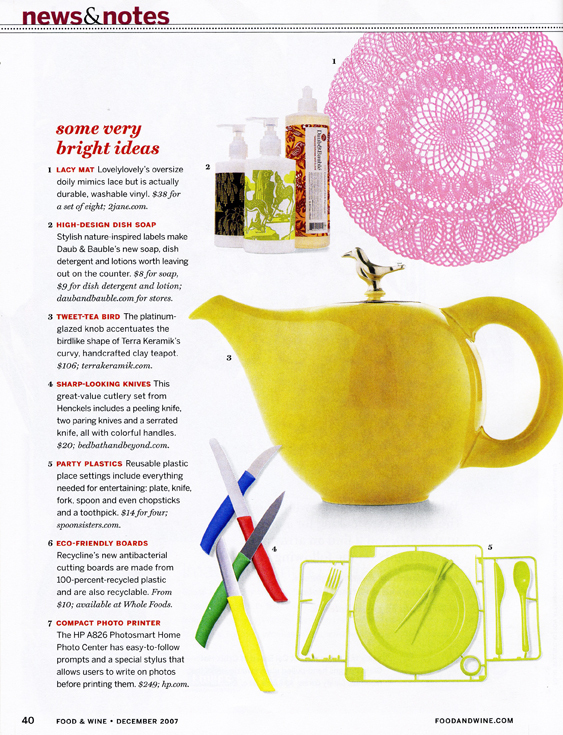 Core77 listed the Bubble Scrubber as one of the necessary items in their “hack to school” guide. Core77 also mentioned Holy Toast HERE. 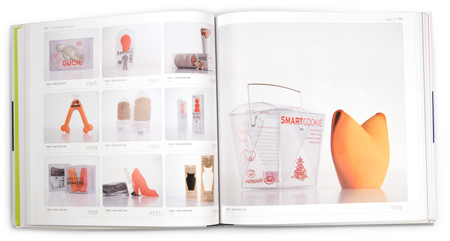 Snap-A-Party and Bubble Scrubber were both nominated for the Cooper Hewitt’s People’s Design Award. Snap-A-Party featured in Food and Wine Magazine Dec ’07. 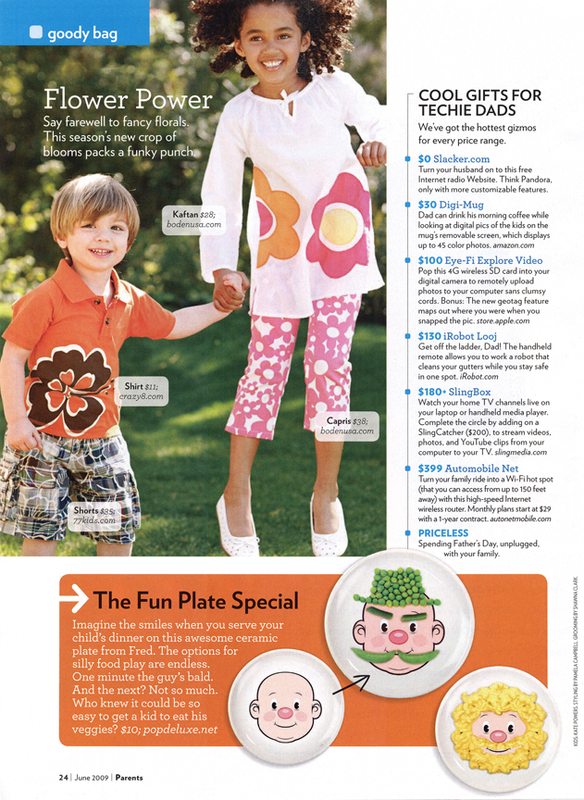 Everyday with Rachael Ray Magazine has Snap-A-Party in the May ’07 issue as well as on her site HERE. My Feet First– New York sewer floor mat made it into the Feb ’08 issue. 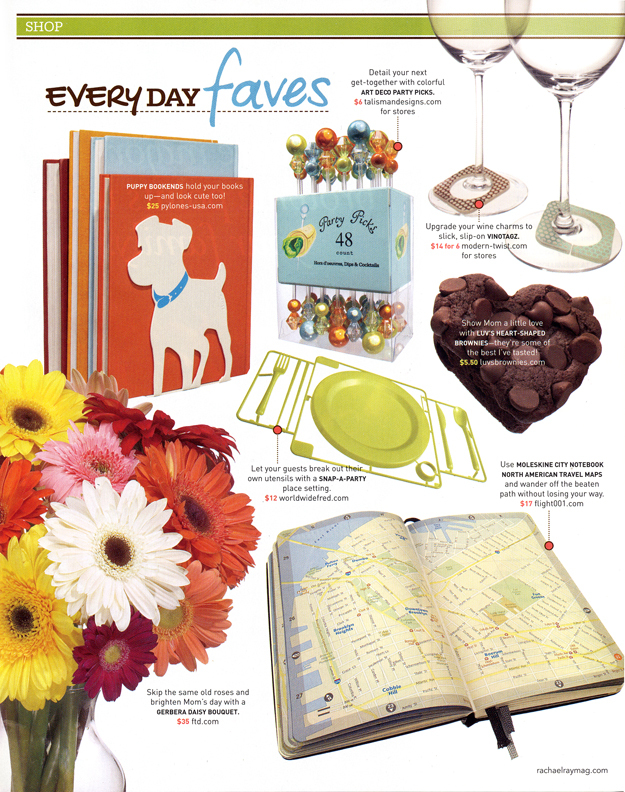 Blockheads featured in the Canadian Magazine Chocolat. Q: Why did you choose image of cassette tape for design? Does it have any special meaning for you? A: The cassette tape was a big part of my life growing up in the 80’s. I loved music, and carried shoe boxes full of tapes with me wherever I went. There was always that inevitable point when your car would decide to eat your favorite Led Zeppelin album. The music would start to slow to a dull moan. You would quickly hit the eject button to try to save it before it was too late, only to pull out streams of your lost tunes. You could try to wind it back in, but it was never the same. This was the inspiration for the bag. The handles are actually made to look like the tape getting pulled from the cassette. To read the article (or try to) click HERE. 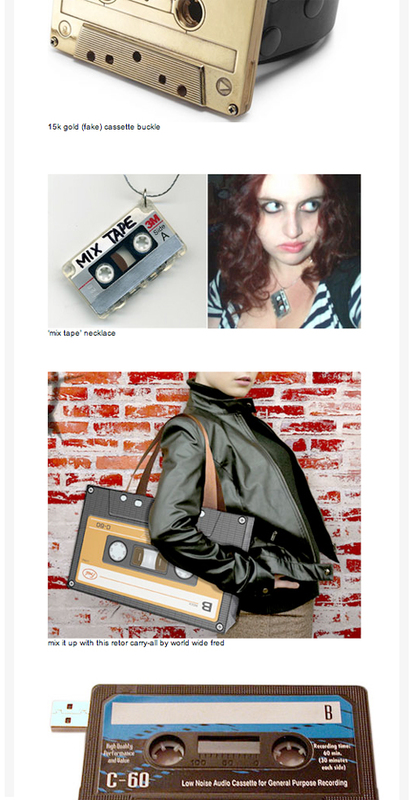 Spoonfork a German online webzine, had something to say about the Cassette Bag. What that is though, I have no idea. 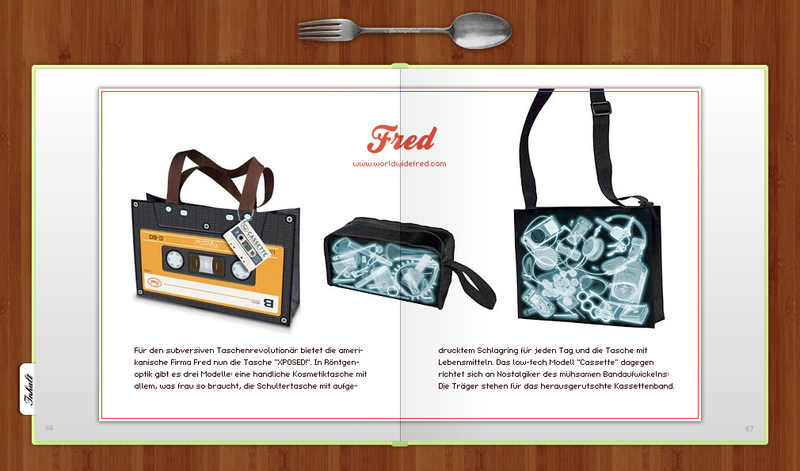 Jasmin, the French fashion and style magazine liked the Cassette Bag. At least I think that’s what they said. 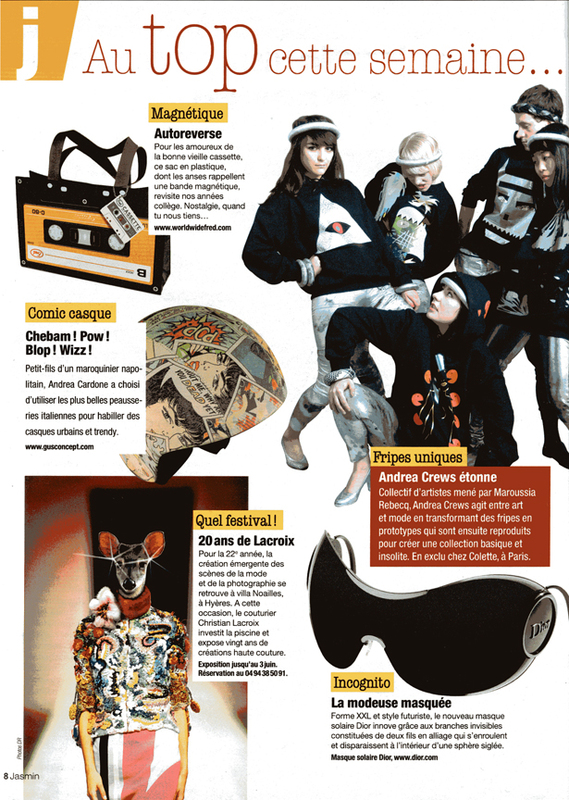 The French Magazine, Le Matin Bleu had some more French things to say about the Cassette Bag. 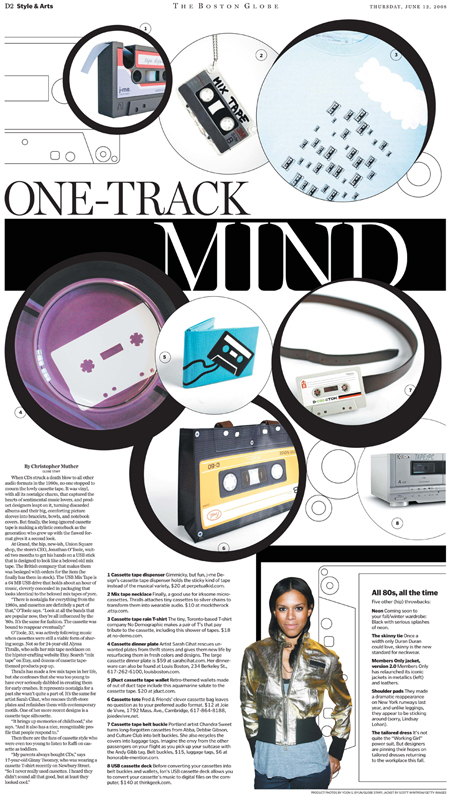 Design Boom, the industrial design super-site has also featured the Cassette Bag in their article on the resurgence of the audio cassette in designed products. A Spanish talk show features the Cassette Bag, as well as the Exposed Bags. I was interviewed back in September of 2006 about the new stuff we were doing at Fred. Even though I hate talking about myself, it ended up being a lot of fun to do. It gives a pretty good summary of our inspirations and motivations in designing for Fred. Click HERE to download the article. Style Century Magazine interviewed me for their first issue. The new online magazine deals with art, antiques and design, and pretty much everything else that’s cool in between. 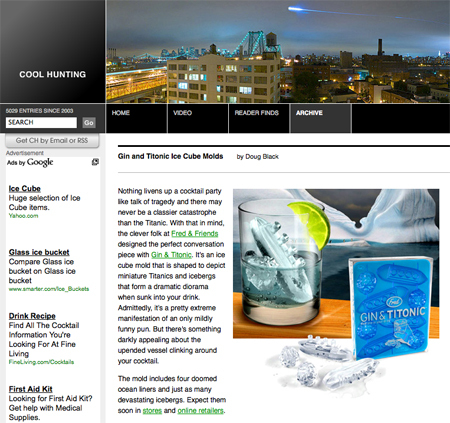 We appear in a great article on bar and party accessories. 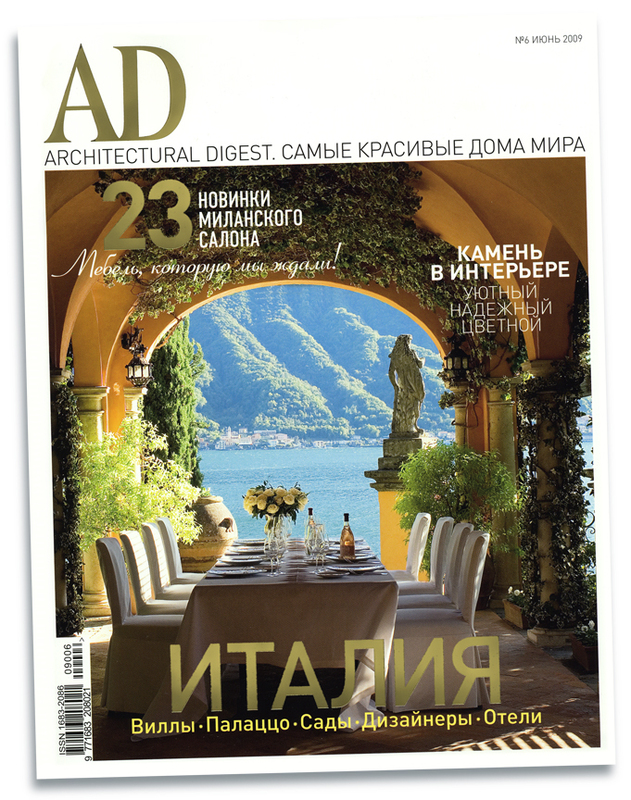 Read the article HERE and visit Style Century to browse through the first issue in its entirety. 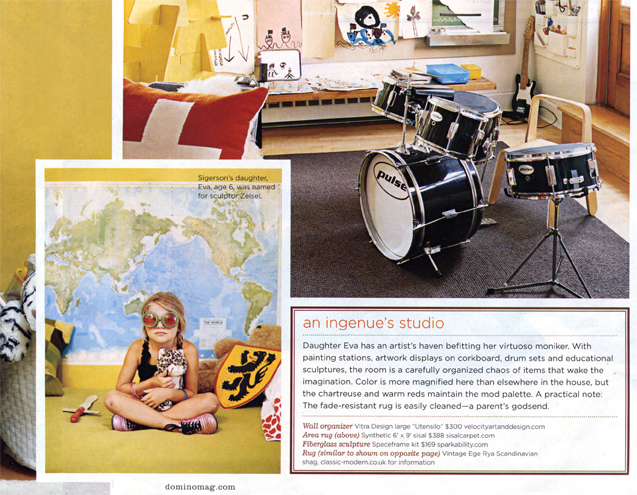 Domino Magazine featured Fly Eyes in a Dec ’05 spread showing off a very cool little girl in her very cool room.